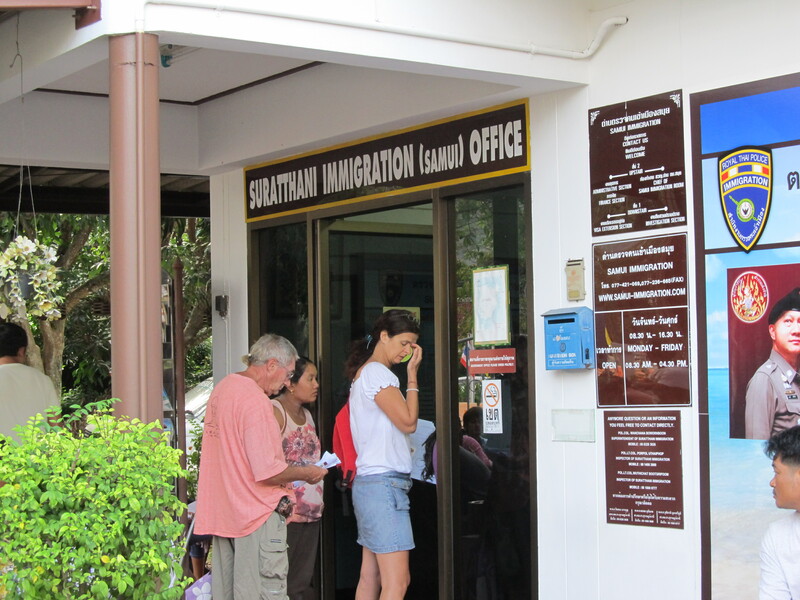 Thailand visas are not as easy to get as other countries. Most places I have visited give you a 90 day visa upon entry. Thailand, however will only give you 30 days, unless you apply for a 60 day tourist visa at an embassy out of the country. I had got mine in Seoul, Korea, originally applying for a 90 day education visa. Unfortunately, the letter from the dive school was from my email and it needed to be an original, so I got a 60 day one instead. 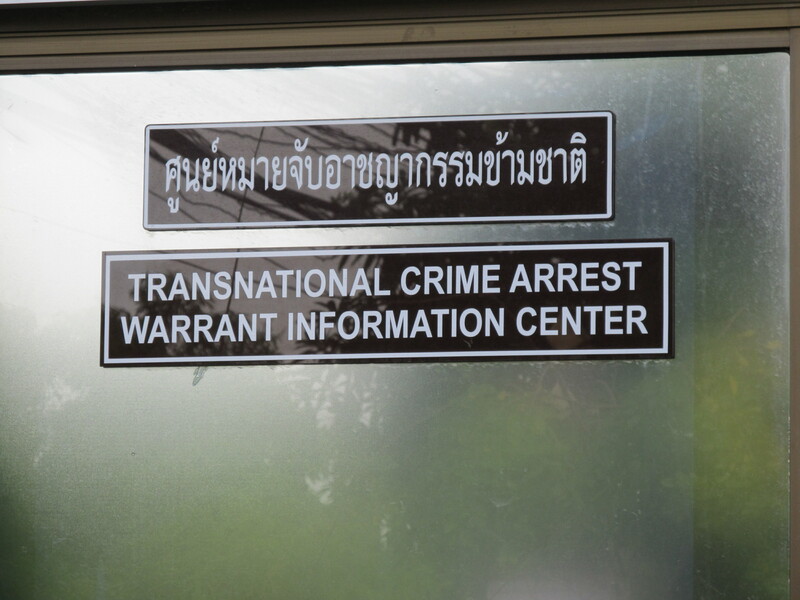 This meant that I would be 10 days overdue when I flew out, the fine is around 500 baht a day. 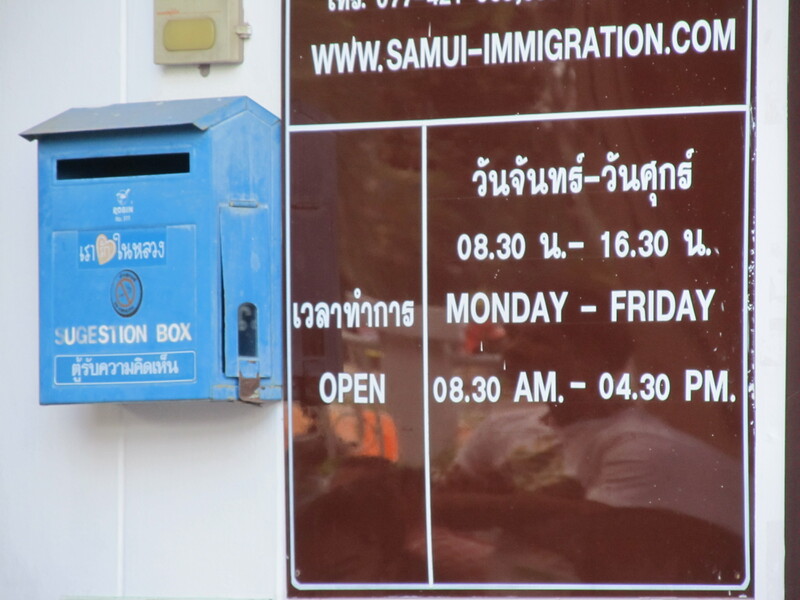 In comparison I could spend about 2000 baht to get a 1 month extension at the immigration office one island away on Koh Samui. Or take the overnight bus to the border of Malaysia and get a 15 day extension with a possibility of a month. 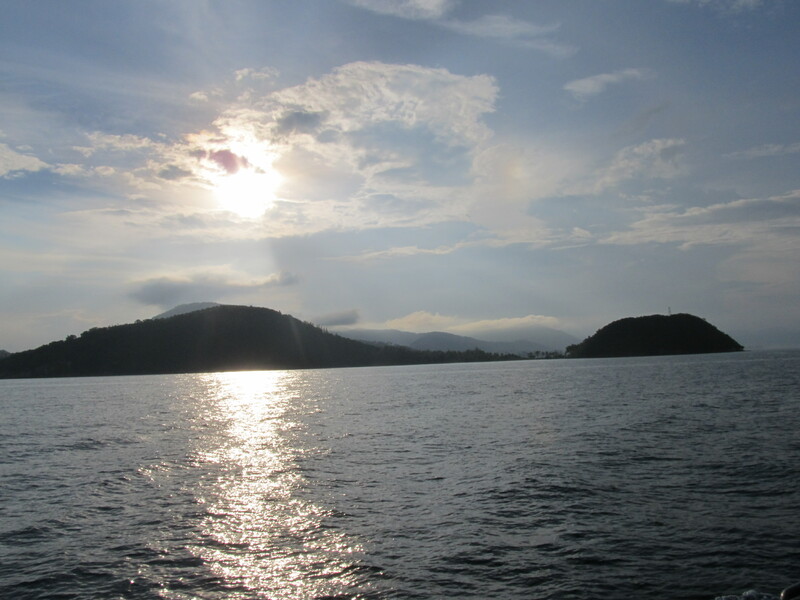 Both cost about the same, but Koh Samui took about half the time. Taking the 7am ferry meant I was awake before 6am on the road. It was barely light and I arrived to fill up just as the gas station opened. There was little hassle getting on the ferry and it turned out I met 2 of my French neighbors also going for a visa extension. A bunch of us shared a taxi and joined the large group already waiting at the office, which hadn’t even opened yet. As soon as the doors barely cracked and the forms were handed out a mad rush ensued. Everyone desperately trying to fill out the forms and give the cash and hand it in hoping they would be done before the last ferry. The estimated pick up time was 20min after the ferry left… this did not look good. Luckily one of the ladies told me to come back in an hour and see if things were ready. I popped over to a cafe and ordered some breakfast, another visa runner asked to join me and we ended up chatting about her yoga training and how we both got here. Then we explored the area a little and finally returned. We were in luck and our passports had just been put in the pile. Woohoo! Then it was a mad dash to return to the port as the ferry was due to leave in 30min. All in all another crazy travel experience. Something I will get lots of practice with when I return. 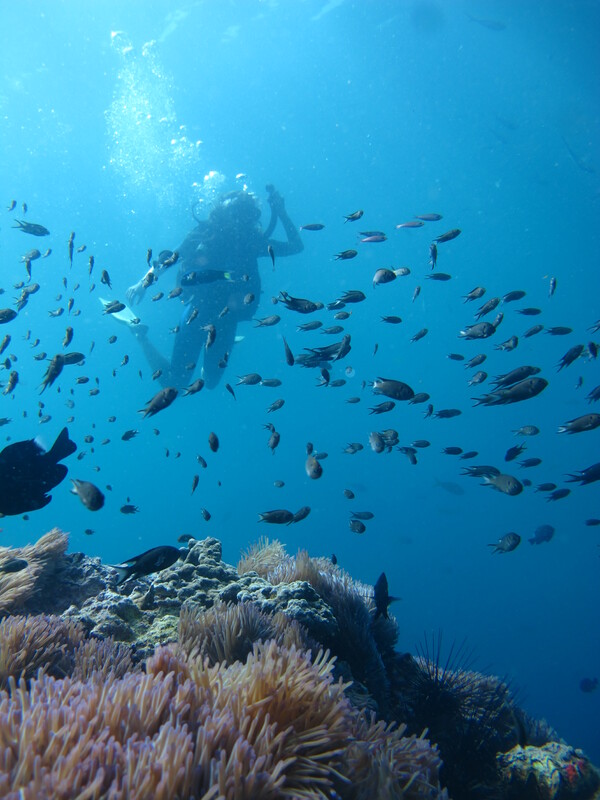 They say “all good things must end”, and unfortunately my time diving in the tropical waters of Thailand were rapidly coming to the end. 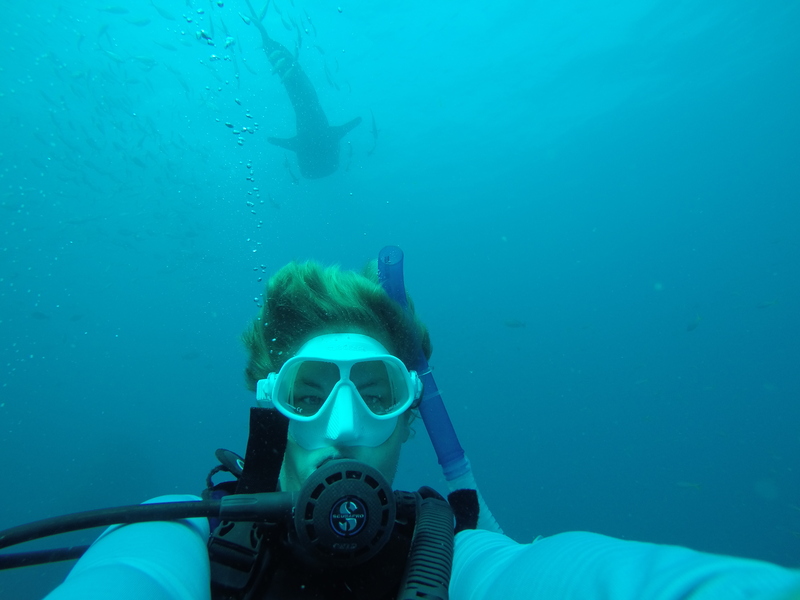 I got to assist all the instructors and divemasters at the shop and a number of the freelance guys as well. Marc, Divemaster from Belgium, required someone to play a guest in a video a friend was shooting as a Christmas message to family back home and I got the supreme honor. It was quite awesome as I got a copy and could show it off to my friends and family. It also meant I sat and criticised my swimming techniques, but at least I know what I need to work on now. On one dive Instructor Ricardo had me brief and lead the dive. The visibility was beyond crap, barely able to see our hands. As we swam along I would stop periodically and have to wait until all 4 divers were almost right on top of me to be sure I hadn’t lost anyone. I had been a little under the weather before the dive and had felt a bit of vertigo so only hoped I wouldn’t get turned around in the muck. As we circled one pinnacle I turned to count and as I turned back and continued round the rock, I just hoped the vertigo hadn’t thrown me off track and leading us in endless circles around the pinnacle instead of the main rock… let’s just say we can laugh about it now… oops! When low visibility and vertigo let you down! On the second dive we had a diver with issues so I ended up taking him back to the ship and Ricardo led the dive through what can only be called pea soup. All too soon my last dive day arrived. 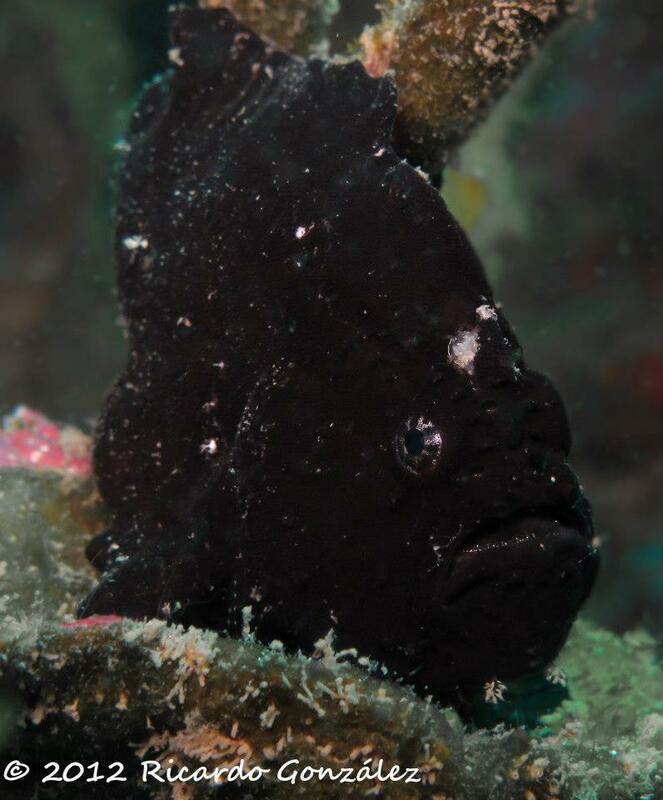 I most likely could have dove the following day as well but after 6 days straight of diving and still packing to go I knew this would be my last, I only hoped it would be good. Boy was I not let down!! 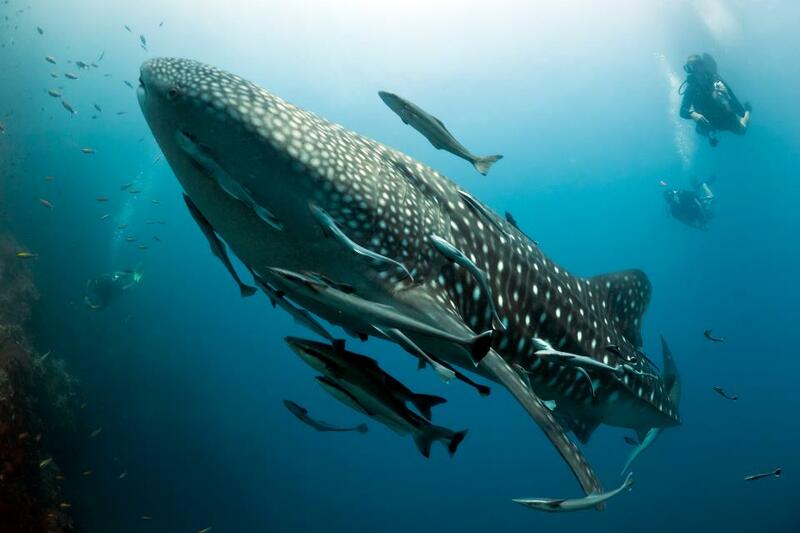 The 3 whale sharks, who had been there for 3 days were still in the area. The smallest one continued to loop from the rock to the boats and back, seemingly fascinated by all these strange sea creatures. Ricardo had a group of 6 Spaniards and our new instructor from Holland had an open water. It was decided that I would swim in the water column between the two groups and therefore be ready if anyone needed me. As it turned out one of Ricardo’s found she had issues with breathing and became a little panicked. 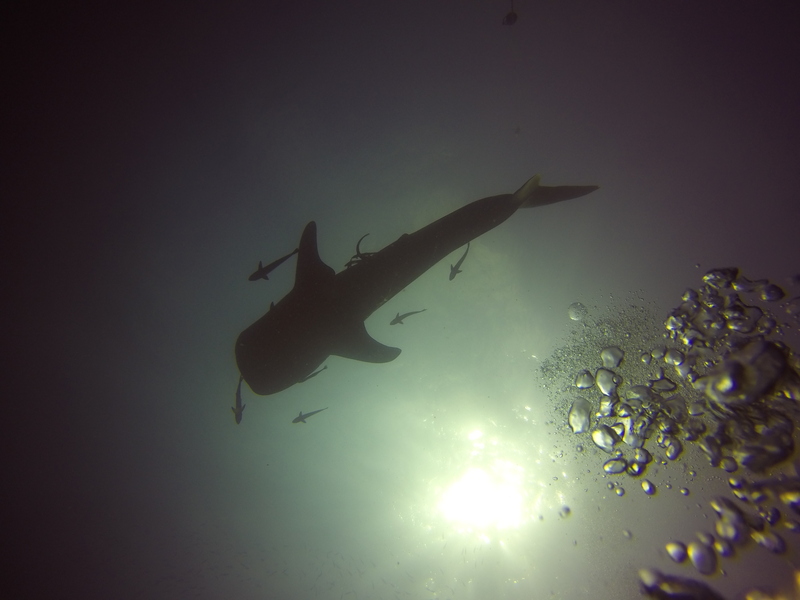 I took her back and she seemed very upset, luckily a snorkel session with the inquisitive what shark perked her up and I suggested the she swim with me, we would take our time and only go as deep as she was comfortable. We descended very slowly to about 6m, she held onto my arm as we swam along and I would give her the “ok” sign every so often and wait for her response of “ok” in return. After about 10min we heard the signal from Marc and he indicated that a whale shark was in the area. I realised it was the smaller one and for some reason I just knew where he was going to head towards. I slowly manuevered her towards a smaller pinnacle a little away from the main rock and we reached 9m. 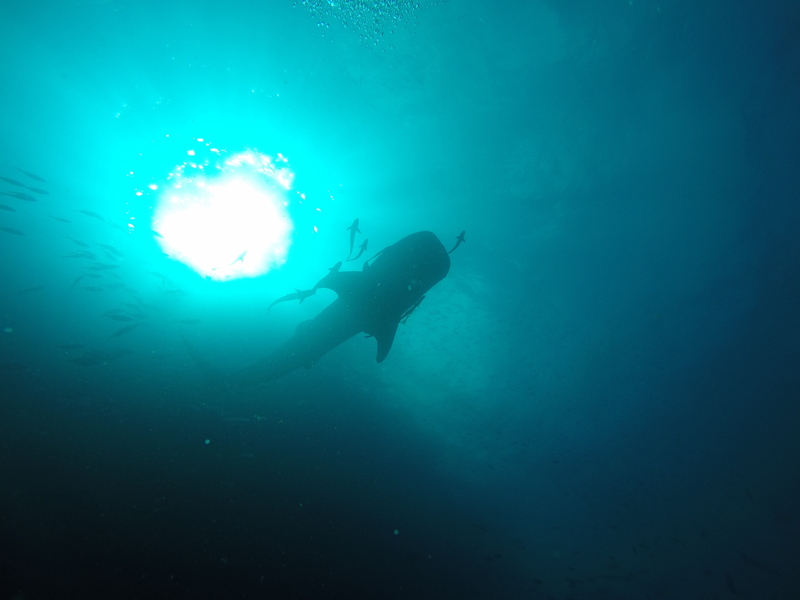 As we got in position the whale shark did exactly what I hoped for, he turned and swam right for us passing above our heads with just inches to spare. We could have put our hands up and touched him (but this is strictly forbidden). It was dream like and I still get chills when I think about that encounter. Afterwards it became apparent that my diver was thoroughly enjoying herself and there was no way she wanted to get out of the water. We reached the point on the rock that would be our spot to surface and spent a good 15min just looking at what we could find on the rock. 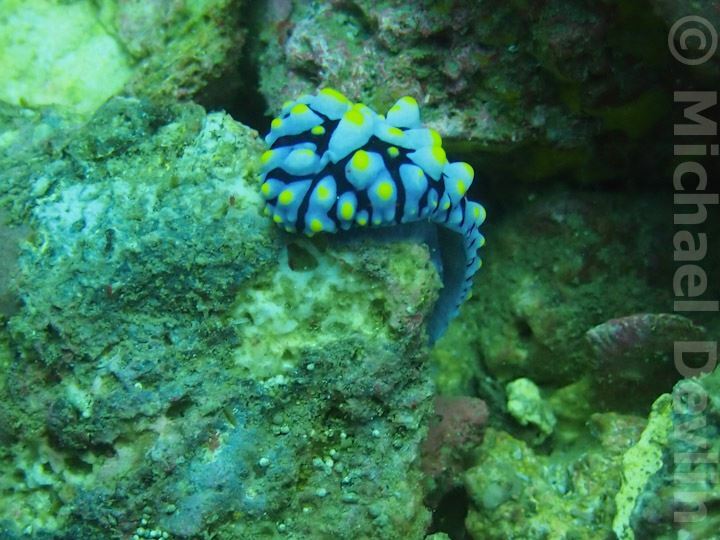 I showed her fish, and anemones, and chrsitmas tree worms (her favorite). 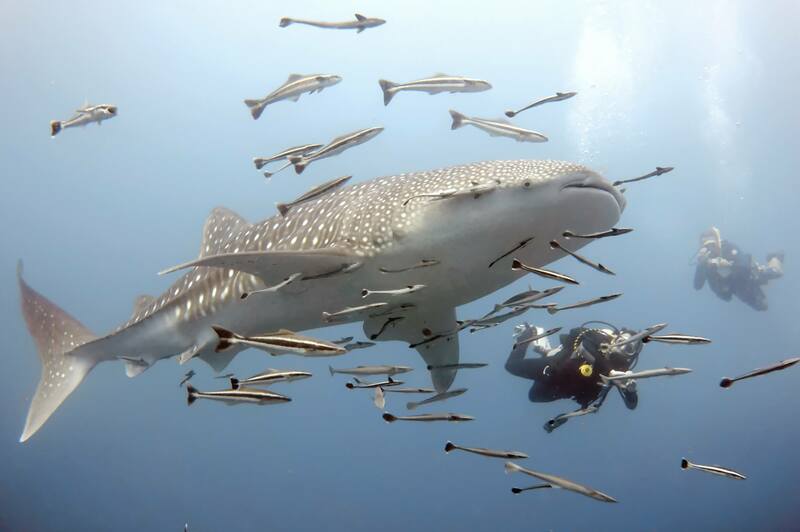 After the dive and on the way home all I heard was a torrent of Spanish interspersed with “KATHY” and “Whale Shark”… It made my day if not my entire time on the island to have a diver enjoy a dive so much. It also made me realise how much I enjoy this job and maybe just maybe this is something I could see myself doing in the future….